Natalie Portman. Hugo Weaving. Stephen Rea. Stephen Fry. John Hurt. Rupert Graves. Roger Allam. Ben Miles. Natasha Wightman. John Standing. Eddie Marsan. Clive Ashborn. Emma Field-rayner. Sinead Cusack. Action/Adventure. Science Fiction. Civil Rights. Politics. Revolution. Superheroes. Media/Journalism. 01 Kelly's Heroes. 01 Dave B's must sees. 01 Ade tastics. Prison. Thriller. Detectives and Private Eyes. Drama. Romance. Peoples' Choice. Sarah's Specials. Recommended. Britain is under the grip of a brutal totalitarian regime but while the people live in wilful ignorance of their lack of basic freedoms one man is determined to bring about revolution and wreak vengeance on those that created him. Taking Guy Fawkes as his inspiration V sets in motion a chain of bloody and explosive events designed to bring the government to its knees and provide the populace with an opportunity to seize back their free will, should their apathy and fear allow them. 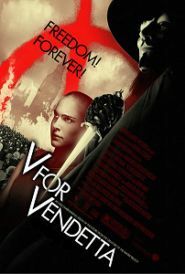 Adapted from Alan Moore's dark graphic novel (originally a diatribe against Thatcher's Britain) V For Vendetta is one of the most effective and intelligent film versions of a comic book superhero to date. Stylish, atmospheric and driven as much by storyline as action it is nonetheless Hugo Weaving's performance as the tortured revolutionary (even though masked throughout) which provides the heart of the film.